It wasn't the sound of drilling and scraping that most irritated Maryellen Hayden during her latest trip to the dentist -- it was the accusatory words of her hygienist that made her want to scream. "How can you work for ACORN?" Hayden recalls the dental worker asking. "It's a corrupt organization." The Association of Community Organizations for Reform Now is a national nonprofit that helps low-income families with housing, voter-registration and other needs. It's the largest community organization in the United States, with chapters in more than 100 cities across the country. But ACORN's critics, like Hayden's dental hygienist, argue that it's also the most crooked. Relatively unknown to most Americans before last fall, the organization has cropped up repeatedly in national headlines since then. For its efforts leading up to the 2008 presidential election, ACORN has been accused of voter-registration fraud in cities across the country, including Pittsburgh. Things got worse after a series of videos surfaced this summer showing ACORN staff members apparently offering advice about tax evasion and other illegal activities. ACORN's local branch is struggling to survive. As the head of the organization's Allegheny County chapter, Hayden says even loyal backers have asked her to take steps like changing her organization's name. "Are the Republican attacks hurting us? Yes," says Hayden. "But they're not going to stop us." Re-branding the organization won't be easy. As funding streams dry up and critics get louder, some wonder if ACORN is about to fall. "It would be a true tragedy if we lose ACORN," says Rachel Canning, a local community activist. "And it looks like we're losing ACORN." Hayden started ACORN's local chapter in 2002. 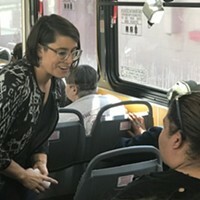 Raised in a poor family on the city's North Side, she says she wanted to do something to help low- and moderate-income people fight their way out of poverty. After being hired by ACORN officials to start a local branch, Hayden -- equipped with a car, a cell phone and flier -- started door-knocking in Garfield. 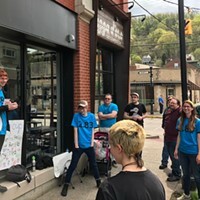 Slowly but steadily, Hayden says she began building interest in ACORN, organizing small groups in Garfield, Beltzhoover and Homewood, and growing the organization's membership along the way. Today, the county's ACORN chapter boasts 7,000 members. And many times, they're easy to spot. Wearing red-and-white ACORN shirts, members are often seen staging rallies, speaking at public hearings and door-knocking throughout the city. The organization joined forces with dozens of other local community groups during last year's fight for a Community Benefits Agreement (CBA) in the Hill District. And more recently, ACORN has teamed with health-care advocates to push for comprehensive health-care reform. The grassroots organizing is meant to produce "power in numbers," Hayden says. "If everyone comes together, there are a lot of things that people can win." Since 2002, Hayden says, ACORN has worked tirelessly to combat predatory lending, stem home foreclosures and offer free income-tax preparation. The organization has also helped prevent more than 1,100 foreclosures in the county. And from 2004-09, she says her group has prepared income-tax forms for more than 3,300 city residents -- free of charge. That work helped ensure that poor families received nearly $2 million in earned-income-tax credit refunds. "They have a tremendous record," says Joni Rabinowitz, co-director of Just Harvest, a local economic-justice organization. "I don't see any organization that works at that much of a grassroots level." According to Allegheny County Sheriff William Mullen, ACORN has proven to be a valuable resource for local residents in danger of being ousted from their homes. "They are very dedicated," he says. "I have no complaints about them." Nationally known conservative pundits like Bill O'Reilly and Glenn Beck have long accused ACORN of wrongdoing, while largely ignoring the group's community work. Those attacks were magnified by accusations of voter-registration fraud during the 2008 presidential election -- allegations that brought condemnation from both sides of the partisan divide. In May, District Attorney Stephen Zappala Jr. announced that authorities would investigate whether ACORN officials could be charged with requiring illegal quotas for voter registrations. Zappala's office alleges that ACORN had quotas -- Hayden calls them "performance standards" -- for how many people field workers had to sign up, and this is apparently an inducement to make up names. Pennsylvania law prohibits organizations from paying workers to collect a certain number of voter registrations. According to Olga Salvatori -- a lawyer representing Eric Jordan, who was charged with registering his own name more than once -- ACORN is rotten at the top. "Employees of ACORN were told that if they didn't meet the quota ... they would not be paid," she wrote City Paper in an e-mail. "The authorities should go after ACORN, not the employees. "It didn't matter to ACORN that Mickey and Minnie Mouse were registered with Daffy Duck and Goofy," Salvatori continues. "They knew they wouldn't be charged and that these employees would." On ACORN's behalf, the American Civil Liberties Union (ACLU) filed a federal lawsuit against Zappala and state Attorney General Tom Corbett in July, hoping to prevent criminal prosecution of the group's local office. The ACLU called the state's anti-quota law unconstitutional. "You can't make goals and performance standards a crime," says ACLU legal director Vic Walczak, noting that the litigation is currently in its very early stages. "If [employees] get zero-to-three registrations every day for three weeks, you can't fire them? That's ludicrous." "Under [the district attorney's] interpretation of the law, it makes it absolutely impossible to do a paid voter-registration drive," agrees Hayden. "You can't just say, 'Go register voters, but if you don't, I don't care, and here's $8 an hour.'" But the hits just keep coming for ACORN. Video footage showing ACORN workers in various cities offering people advice on tax evasion, child prostitution and human smuggling have sullied the group's reputation even more. (The videos, none of which were captured in Pittsburgh offices, were created as part of a conservative set-up trying to goad ACORN workers into the illegal activities.) So have new developments in embezzlement charges targeting former national-level ACORN officials. Since then, Congress has voted to cut off ACORN from all federal funding. The IRS has also announced that ACORN is no longer approved to provide free tax-preparation assistance. "I've come to the conclusion that ACORN is not a good organization," says Heather Heidelbaugh, a Pittsburgh attorney and vice president of the Republican National Lawyers Association. "They've tried to convince the culture that their motives are pure, but I'm not convinced of that." Heidelbaugh, a lawyer for an ACORN whistleblower from Washington, D.C., testified before Congress earlier this year, accusing the group of running a "muscle-for-money" program where ACORN would charge unions and other groups to organize protests against companies. ACORN officials have denied the accusations. "It's a smear campaign!" charges Hayden. "They're coming after ACORN because ACORN is successful." In fact, a study released in September found that ACORN's problems were largely created by the right-wing media. The independent study, "Manipulating the Public Agenda: Why ACORN Was in the News, and What the News Got Wrong," analyzed nearly 650 stories about the nonprofit that appeared in major news outlets from 2007-08. 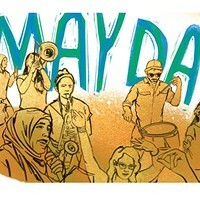 "The attacks on ACORN originated with business groups and political groups that opposed ACORN's organizing work around living wages, predatory lending, and registration of low-income and minority voters," states the study, conducted by professors Peter Dreier and Christopher Martin. "Most of the news-media coverage about ACORN carried one-sided frames, repeating the conservative and Republican criticisms of the group without seeking to verify them." Specifically, the study reveals that the media consistently failed to distinguish voter-registration accusations from charges of actual voter fraud. According to the researchers, "82.8 [percent] of the stories about ACORN's alleged involvement in voter fraud failed to mention that actual voter fraud is very rare." Local members, meanwhile, say they're ignoring the attacks. "We're not letting it get to us," ACORN member Nettie Pelton told CP during an Oct. 20 health-care reform rally Downtown. "We're still doing our job." "We have to stay positive," added Andre Mobley, another ACORN member. But that's getting harder to do. For one thing, "The other social-justice organizations and unions, and even many politicians, haven't really come out strongly to defend us," says Hayden. On a few recent occasions, she says ACORN members have chosen not to wear their colors while demonstrating with other organizations. "They're afraid of having the attack swap over to them." "There is that worry," acknowledges Rabinowitz. And according to Brian Kettenring, deputy director of ACORN's national operations, the scandals have had "adverse impacts" on fundraising, too. Funding for ACORN comes from a variety of sources, including foundations, membership dues and fundraising events. Hayden estimates that roughly half of her chapter's money comes from foundation grants. But as a result of the negative PR, she says, "We basically have no foundation money at the moment." The local chapter recently laid off two staff members from her office. "It's a very problematic situation. We're scrambling to raise as much money as we can" through fundraisers. Nationwide, ACORN recently lost the financial support of the Catholic Campaign for Human Development -- a national anti-poverty campaign. Another local funder, says Hayden, recently said it would continue donating to the local chapter only "if we changed our name." Hayden declined to name the foundation, along with others that have pulled funding, since she is still negotiating with them. She says she gave the renaming proposal serious thought, but decided that without the ACORN name, and its connections to the national organization, "We'd just be a little community organization, just like all the others," she says. Hayden says her chapter's survival will hinge on its ability to become self-sustaining. Although she realizes that foundation support is crucial to stay afloat for the next year or two, Hayden soon hopes to have ACORN running completely on membership dues and fundraisers. To meet that goal, the local chapter is currently embarking on a membership drive. And just before Thanksgiving, Hayden says she plans on inviting Pittsburgh's unions, social-justice groups and foundations to a large meeting promoting ACORN's work. "ACORN is taking some really terrible attacks right now," she says. "But it's impossible to destroy us."